This young boy's holiday present is a "Geo. 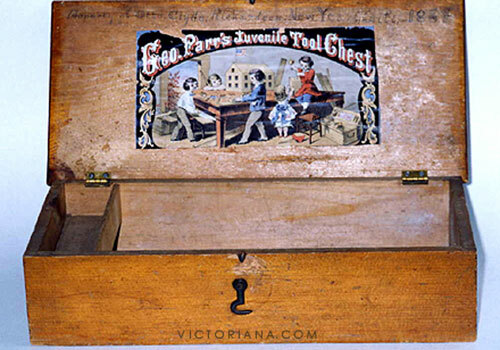 Parr's Juvenile Tool Chest," a popular Victorian toy for boys in the mid-nineteenth century. It is marked across the top as a "New Year" gift for 1869. George Parr was a well known manufacturer of tools during this period. "Parr's Tool Chests" were advertised in many magazines as the best for planters, gentlemen, farmers, mechanics, youths, and boys [see 1862 ad below]. Close-up of label on boy's antique tool chest. 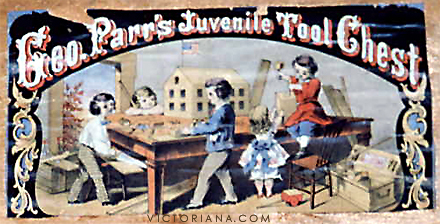 Advertisement from 1862 for "juvenile tool chests, suitable presents for the holidays". Advertised by George Parr, Buffalo, New York [text below]. WHAT EVERY FARMER, MECHANIC, AMATEUR and well-regulated household wants -- one of Parr's Tool Chests, fitted up with a complete assortment of tools, such as saws, planes hatchets, hammers, chisels, draw shaves, rules, files, augurs, & c. Will pay for itself in one year in saving of carpenter's bills. Planters' size contains 92 tools, price........... $30 each. Gentlemen's size contains 80 tools, price........ 20 each. Youth's size contains 62 tools, price................13 each. Boys' size contains 44 tools, price................... 8 each. Made of the best cherry and ash exterior, French polished with brass trimmings and lifting handles, and drawers to contain every article. Superior tools sharpened and set ready for use. Packed in cases and shipped to any address on receipt of the price, by the manufacturer and inventor. Also, juvenile tool chests, suitable presents for the holidays, containing 15 tools, price $4 each ; 10 tools, price $3 each; 8 tools, price $2 each. GEORGE PARR, Buffalo, New York. 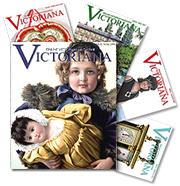 In 1861, Charles V. Mapes Illustrated Catalogue featured a Youth’s Tool Chest for $13; Boy’s Tool Chest for $8; and a Juvenile Tool Chest for $2.50. In 1864, Bliven, Mead & Co.'s Illustrated Catalogue featured several Geo. Parr’s tool chests. The Geo. Parr’s Planters Tool Chest was 2 ft. 11 in. long; 1 ft. 4 in. wide and 11 inches high. It was made from the best Cherry and Ash, exterior French polish, with brass trimmings and lifting handles. It included partitions and drawers to contain each article. The catalog also listed a Youth’s Tool Chest that was 1 ft. 10-1/4 inches long, 12-1/4 inches wide, and 9 inches deep made from best cherry exterior French polish with brass trimmings and lifting handles. Sixty-two different tools, besides the chest, were packed in cases for shipping. The Boy’s Tool Chest was four inches smaller and 8 inches deep with the same finish as the Youth’s Tool Chest and included forty-four different tools. The Juvenile Tool Chest was neatly varnished with brass hinges, lifting handles and lock. According to the ad, a “beautiful Colored Engraving accompanies each Chest,” as is featured in the photo above.